Here, in an extended outline form, is a series of lessons on the seven biblical covenants. Surveying them gives you a mini-tour of a large portion of the Bible, both Old and New Testament. 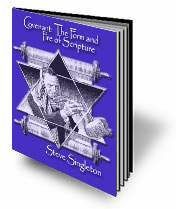 Here is a careful and detailed study of the seven covenants of the Bible: Adamic, Noahic, Abrahamic, Mosaic, Levitical, Davidic, and the New Covenant (Christ's). Presented in extended outline form in 25 lessons, this ebook provides you with all of the biblical references you need to make a thorough study of the covenants of the Bible, which provide it with both its form and its fire. You will also learn about how the biblical covenants parallel extra-biblical covenants like the Hittite suzerain-vassal treaties. You will discover how the prophets used covenant lawsuits to call their people back to God. Significant also is how the covenant became distorted and the way in which Christ called people back to the true meaning of the Law. We will also look at the relationship between the Old (Mosaic) and the New (Christ's) covenants and explore the covenant stipulations under Christ. So much of the Bible is covered in this study that you can use it as an introduction to the Bible as a whole. An excellent list of recommended books for further study close out this valuable e-book. 65 pages. 627 Kb.